Let your child laugh and play with our Gund Exclusive Peek-A-Boo Teddy Bear. 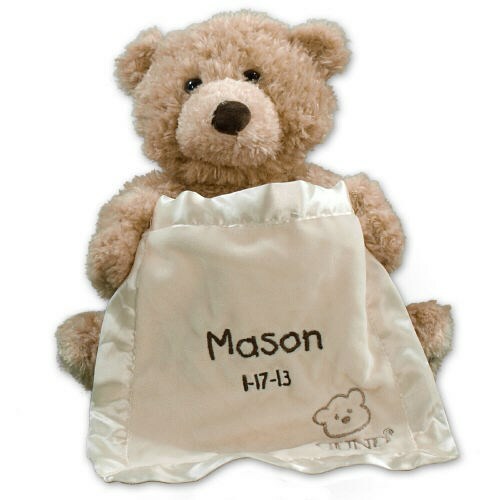 Holding a cream-colored blanket, this beige soft plush bear will raise and lower his blanket to play a game of peek-a-boo when his foot is pressed. The bear’s mouth moves as he says “Peek-a-boo, I see you,” and other phrases to the child. My grandson loves his bear! We are very pleased with our purchase!! A sweet little bear, very well made. Looking forward to giving it to my grandchild. Additional Details 800Bear.com offers a fun collection of Custom Printed Baby Push Animals, perfect for your son, daughter, grandchildren, nieces and nephews to enjoy.